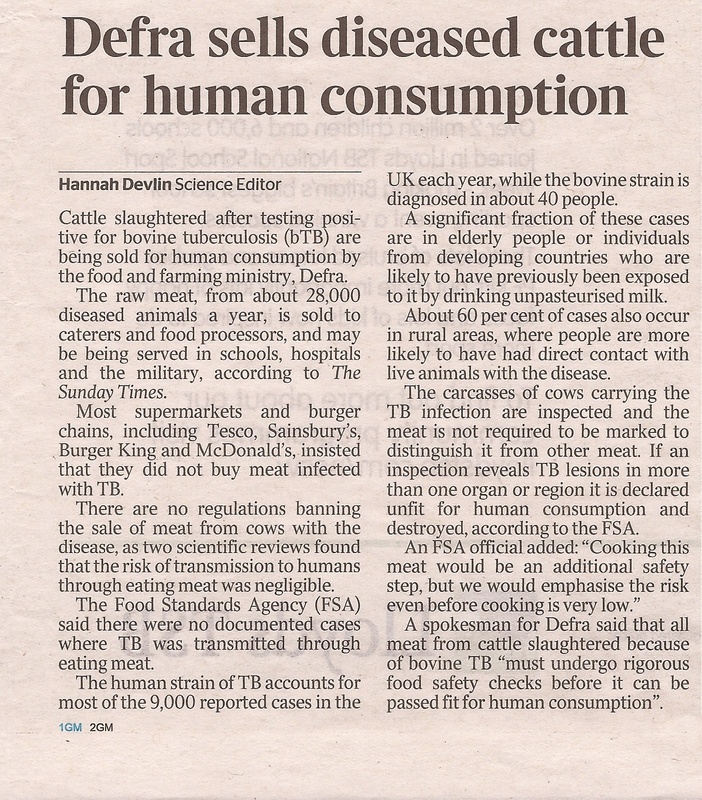 Those of us who clearly recall the UK Foot & Mouth epidemic of 2001, will remember the lamentably inept and unpersuasive official PR that then proclaimed the only way to treat such visitations was the Kill & Burn strategy, and that the very idea of vaccinating cattle in between these visitations was ludicrous, though I can recollect a number of letters from experienced rural veterinarians to the Times in support of such vaccination. Well, here's my fivepennyworth of (quite possibly naïve) suggestions towards a long-term policy of humane bTB prevention. It would, incidentally, help to humanely counter the current overpopulation of badgers (their natural predators having been wiped out by Man) that is also being advanced as a jolly good excuse for banging away at Mr and Mrs Brock. DEFRA (Department for the Environment, Food and Rural Affairs) replaced MAFF (Ministry for Agriculture, Fisheries and Food) in 2001/2 after the latter had been widely criticised for its mis-handling of the 1990's outbreak of BSE (Bovine Spongiform Encephalopathy aka Mad Cow Disease) and the 2001 outbreak of F&M (foot and mouth disease). 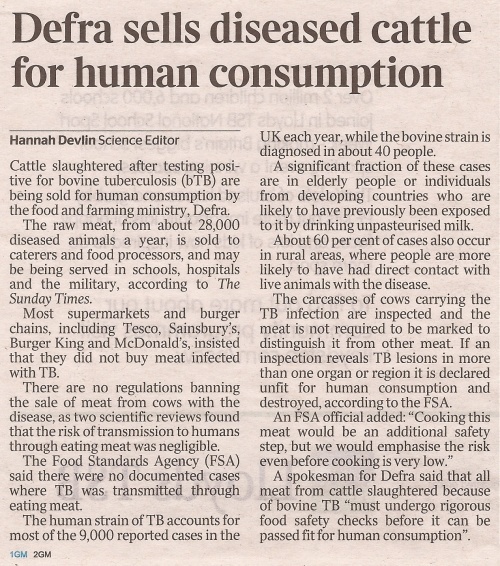 But DEFRA are evidently every bit as intellectually stretched, in this instance at least, as their hapless predecessors. If meat infected with bTB is safe to eat, and pasteurised milk is in any case safe to drink – what is the problem? Cui malo? Why shoot badgers? One last rant, before Nurse brings my pills. Bovine Tuberculosis (bTB) can infect any mammal including humans (both my wife and I suffered TB during early childhood) and domestic pets (such as cats and dogs), farmed animals (such as cows, horses, pigs, sheep and goats) and wild mammals including badgers, deer, foxes, mink, moles, rats, wild boar, and even birds. This doesn't mean, of course, that all of these species are endemically infected or are effective vectors to other species. The natural reservoir of bTB is indeed the cow, though it is alleged that badgers are the principal vector. "Death solves all problems – no man, no problem" said Stalin, neatly turning the proverb on its head. To farmers, the badger is the problem, but to the badger the cow is the problem. We look back in horror at historical massacres of human populations seen as 'problems' (Cathars, Huguenots, Armenians, Jews, and on, and on). The real problems were the perceivers, not the perceived. If bTB persists despite culling of badgers, the Stalinist mindset of officialdom will see extermination of badgers as the next step. And if bTB persists despite extermination of badgers, DEFRA (or their successors) will doubtless feel obliged to work their way through all the other species I mentioned above, except humans of course. And if bTB still persists, what then?? ?